What is The Diversity Project? I have two exams tomorrow which means, naturally, that a great deal of today will be spent procrastinating–and what better way to procrastinate than with facebook. Browsing the status updates I came across a post on Nicky’s wall, linking to a story that ran in yesterday’s Daily Mail–a British newspaper for those of you not in the know. 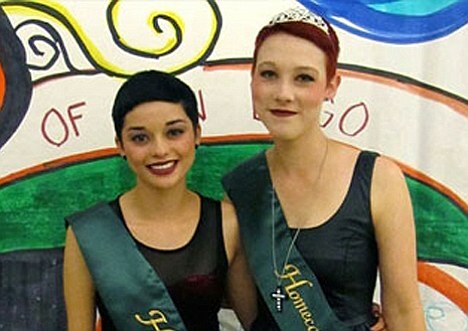 The story was about a young lesbian couple–Rebeca Arellano and Haileigh Adams, seniors at Patrick High School in San Diego–who were crowned as Homecoming King and Queen over the weekend. Rebeca was crowned Homecoming King at Friday’s pep rally, and Haileigh crowned Homecoming Queen as Saturday’s dance. To say that this makes my heart glow is an understatement–in fact, as my friend and Writing Center colleague Ashley will attest to, it actually made me cry. So many of the stories that we hear are so desperately tragic that to hear such positive news is wonderful–and proof that although we still have SUCH a long way to go, we’re making tiny, tiny baby steps. These girls were chosen from their peers–what more affirmation do we need that at least in some parts of the world (and I know, it’s not happening in enough parts of the world, not by a long chalk) being LGBT is accepted–not simply tolerated–and that love among two people, whoever they happen to be and however they identify themselves, is celebrated. There’s more of the story here, on the Daily Mail’s website, and it’s worth looking at for the lovely photographs and the video clip of Rebeca speaking about the weekend’s events. Among other things, this story is a reminder to me that the Diversity Project is as much about celebrating life as it is about remembering the lives that have been lost. And so, there WILL be a square in the blanket in celebration of Rebeca and Haileigh (I’m thinking it has to have embroidered crowns on it…) and their story will be told alongside everyone else’s–their relationship, their love, and the hope that their story brings will be shared with other people who need to hear the positive stories and the changes that are happening, albeit slowly. So, before I head back to studying for these flippin’ exams, I’d like to raise a metaphorical glass to Rebeca and Haileigh, and offer my congratulations and love to them both. Cheers, girls. This entry was posted in Uncategorized and tagged blanket, community, crochet, diversity, diversity project, education, emotional, events, facebook, gaines, haileigh adams, homecoming, kentucky, knitting, lexington, lgbt, media, patrick henry high school, photos, planning, press, project, rebeca arellano, san diego, school, tears, twitter, uk, university, yarn by ukdiversityproject. Bookmark the permalink.